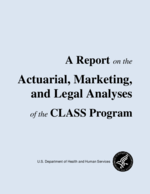 A Report on the Actuarial, Marketing, and Legal Analyses of the CLASS Program. Alternatives to a Cash Benefit: Flexibility of Today’s Long Term Care Insurance Products with a Reimbursement Model. The biggest advantage of the cash disability model, when first introduced, was the flexibility for the insured to use non-traditional providers or less costly providers for non-institutional care and to cover services not typically covered at that time (e.g., assisted living facility care, caregiver training, devices, respite or hospice care). However, reimbursement type policies have significantly diversified to accommodate a vast array of new types of providers, services and benefits. One of the most important -- coverage for care in an assisted living facility -- while virtually unknown as a benefit in the 1990s is universally covered in today’s policies, usually at the same benefit level as nursing home care. Other benefit provisions which offer much of the same flexibility of a cash benefit are discussed below. The prevalence of these features in policies being sold today (based on data from 2008 sales) is strong. These data, exclusively for the individual market, are summarized in Figure 1 and discussed below. Caregiver training typically provides a total benefit amount (sometimes expressed as a multiple of the nursing home DBA -- e.g., 5 x DBA) to teach an informal caregiver how to safely provide personal care and supervision. The vast majority of plans offer this as a base feature in the policy, but one company does offer it as a rider. As a result, 99% of buyers in 2008 had this feature as part of their coverage. Informal Caregiver Benefits allow payment to an informal (non-licensed) caregiver. Definitions of who qualifies as an informal caregiver may vary; some policies include family under any circumstances and some may limit the use of the benefit to family not living with the claimant on a regular basis. Nine of the 23 companies surveyed in 2008 include an informal caregiver benefit -- most as a feature in the base policy. Overall, just under over 70% of all buyers had a policy with this feature. Monthly Home Care: Since most people do not receive the same amount of care on a daily basis, having a monthly home care maximum instead of a daily limit gives the flexibility to “stack services” on days when people need more care and to preserve benefits on days when they do not need paid care. While once fairly unique, most policies today do offer a monthly home care. Only four companies selling in 2008 do not have a monthly home care benefit. As a result, over 50% of all buyers in 2008 obtained a policy and/or rider that provides the flexibility of a monthly home care benefit. An Indemnity Benefit pays a flat dollar amount when covered expenses are incurred, even if the benefit payment exceeds the amount of expenses. The insured can then use the difference essentially as a cash benefit to pay for some items not otherwise covered under the policy (e.g., private duty nurse in a nursing home stay). About half the companies selling in the individual market offer an indemnity benefit payment either as integral to the policy or through the offer of a rider. Of 2008 buyers, 7% obtained this provision as a base feature of the policy while 4% purchased it as a rider. An Alternative Plan of Care provides flexibility for the insured to request the insurer to approve coverage for providers, treatments, services and care settings not otherwise covered under the policy. While most carriers do not authorize a cash payment under this provision, it is used to provide flexibility to pay for home modification, equipment, transportation, informal caregivers, family care and many other things. Overall, 80% of 2008 buyers obtained a policy with an APC as a base feature of their coverage. Home Modification and Equipment benefits are designed to enhance independence when someone has ADL impairments and typically include things like wheelchair ramps, tub rails, and other adaptive devices. Access to this benefit is also widespread. Over 84% of buyers in 2008 had a policy with this feature either as an integral component of the coverage, or (2%) as a rider. International Care. Many policies now pay for care abroad, either as a routine policy feature or on a limited/defined basis. Over 80% of buyers in 2008 had a policy with this feature as an integral component of their coverage. Data on the extent of these flexible benefits in the group market is less readily available. However, Broker World 2009 indicates that six carriers in the group market include coverage for informal care and/or family care. Sometimes the option is made at the employer level when they select the package of benefit features to offer and sometimes it may be an integral policy component. The Federal Long Term Care Insurance Plan also includes a benefit for informal and family caregivers and CalPERS has a provision for coverage for independent providers who are not licensed or agency-affiliated.